Hank Albert Azaria (lahir di Forest Hills, 25 April 1964; umur 54 tahun) adalah seorang pemeran, sutradara, dan komedian berkebangsaan Amerika Serikat yang menjadi terkenal saat bermain di film utamanya seperti Tuesdays With Morrie dan Uprising. Dia berkarier di dunia film sejak tahun 1988.
won the Screen Actors Guild Award for Outstanding Performance by a Cast pada tahun 1997. Anastasia Bartok Memenangkan Annie Award untuk Outstanding Individual Achievement for Voice Acting by a Male Performer dalam Animated Feature Production. Bartok the Magnificent Bartok Direct-to-video release; also producer. Nobody's Perfect Ray Short film; also producer, director and writer. Won the "Film Discovery Jury Award for Best Short" at the US Comedy Arts Festival. 1988 Family Ties Joe Episode "Designing Woman". 1989 Growing Pains Steve Stevenson Episode "The New Deal: Part 2"
won the Primetime Emmy Award for Outstanding Voice-Over Performance in 1998, 2001 and 2003. 1990 The Fresh Prince of Bel-Air Policeman Episode "Mistaken Identity"
Babes Tony Episode "Rent Strike"
Street Sharks Shark Blades Episode "Only Human" Parts 1 and 2.
nominated for the Primetime Emmy Award for Outstanding Guest Actor - Comedy Series in 2003. 1995 Tales from the Crypt Richard Episode "Doctor of Horror". nominated for the Primetime Emmy Award for Outstanding Guest Actor in a Comedy Series in 1998. 1998 Stressed Eric Eric Feeble Re-dubbed Mark Heap's dialogue from the UK version of the series for the US airing. nominated for the Screen Actors Guild Award for Outstanding Performance by a Male Actor in a Miniseries or Television Movie in 2000. 2001 Futurama Harold Zoid Episode "That's Lobstertainment!" Uprising Mordechaj Anielewicz TV film; nominated for the Broadcast Film Critics Association Award for Best Actor in a Picture Made for Television in 2001. 2004 Drawn Together Pizza Delivery Man Episode "Dirty Pranking No. 2"
and the Screen Actors Guild Award for Outstanding Performance by a Male Actor in a Drama Series in 2005. 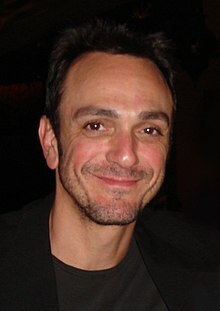 Wikimedia Commons memiliki media mengenai Hank Azaria. Halaman ini terakhir diubah pada 24 Oktober 2018, pukul 03.34.